“As off-the-road mobility niche specialists, we believe that to ensure the lowest operating cost solution (LOCS) of a forklift, you need to have the right tire for the application you're running,” says Erick Bellefleur, Product Line Director Material Handling. “Understanding the intensity of that application is key to maximizing tire life and ultimately, the payback on your tire investment,” continues Bellefleur. 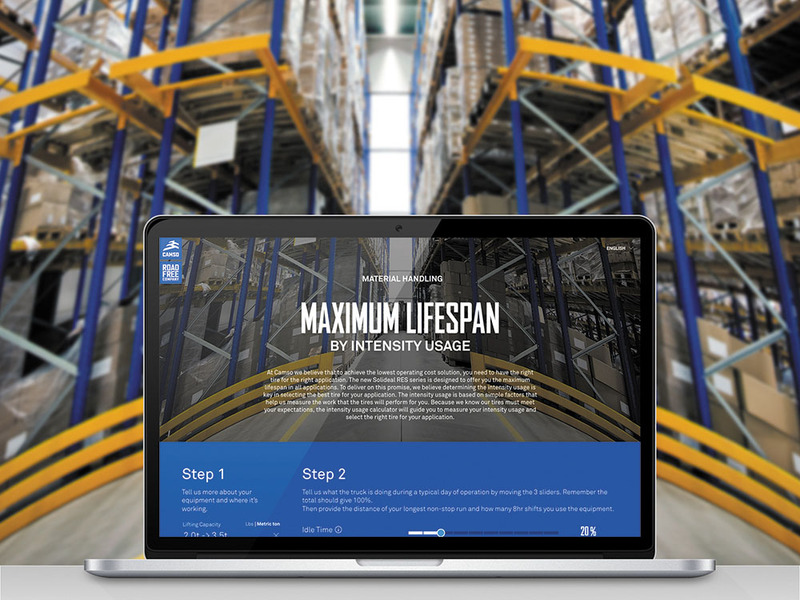 Camso has developed its usage intensity calculator, a web-based tool that quantifies different levels of forklift application intensities. Fact-based, built on thousands of hours of testing, it takes into account parameters like lift capacity, working environment as well as idle, travel and maneuvering time. In a few clicks, the systems outputs a forklifts' application intensity score. It also offers a recommended Solideal tire manufactured by Camso promising maximum tire life for the application analyzed. “Forklift fleet owners expect maximum life and that's what we promise. We believe tire life should be a given,” says Simon Richard, Vice President and General Manager - Aftermarket Division at Camso. “For this to be true, you need to be able to match the tire to the intensity level,” he says. This type of thinking lead Camso to bring to market a new generation of resilient tires. The company recently introduced three models of solid tires: the Solideal RES 330 for low intensity applications, the Solideal RES 550 Magnum Series for medium intensity applications and the Solideal RES 660 Xtreme Series for high intensity applications. To explain why usage intensity is important in tire selection, the company also published this video. The new line-up provides solutions for a multitude of conditions and Camso's maximum lifespan calculator is the perfect tool to match the right tire to any given job in material handling.